There is a little-known secret in music, known as Gamma; a scale which music fans may one day recognize for its exotic melodies (hear tracks: 1 & 5), purity and clarity of harmony (hear tracks: 3, 7 & 8) and its ability to be recognizable when it wants to be (hear track 4 Jingle Gamma Bells). Microtonal musicians will know Gamma as one of the scales discovered by Wendy Carlos, which divides the perfect fifth into 20 equal steps. With no pure octave, Gamma forces composers to think about harmony and melody structures in new ways. Every track of Gammatar makes the most of the elusive Gamma scale. This is music which is subtle and otherworldly, at times melancholic and at others sophisticated. Gammatar features a number of silky-smooth Omnisphere guitar sounds throughout the album. Overall a very relaxing and deep experience here, but with a very upbeat bluesy number during the first half, to shake things up. Carlo’s experiences in unravelling the mystery of the Gamma scale have been documented on his blog over the last year and have been a fascinating read for many people in the microtonal scene. He has shown that by using his very snazzy, very pretty Opal Chameleon keyboard (see video) he can overcome the challenge of navigating Gamma’s “too many notes”, at least in so far that he can use it to create this beautiful album! 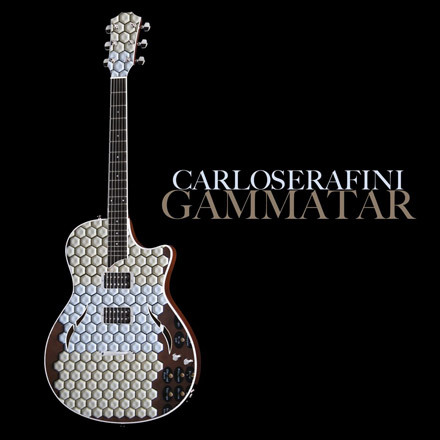 Gammatar by Carlo Serafini is licensed under a Attribution-NonCommercial-NoDerivs 3.0 Unported License.